The family had a large property and had always been interested in a pool. But with their daughter leaving soon, it suddenly felt as though time was of the essence to finally begin their pool design. 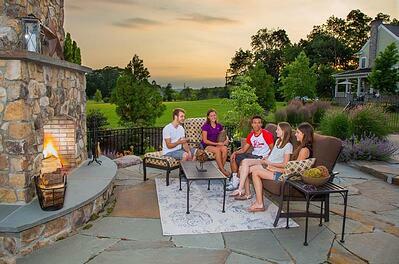 To get started, the family was looking for the right pool builders in Lancaster, PA to bring their ideas to life. 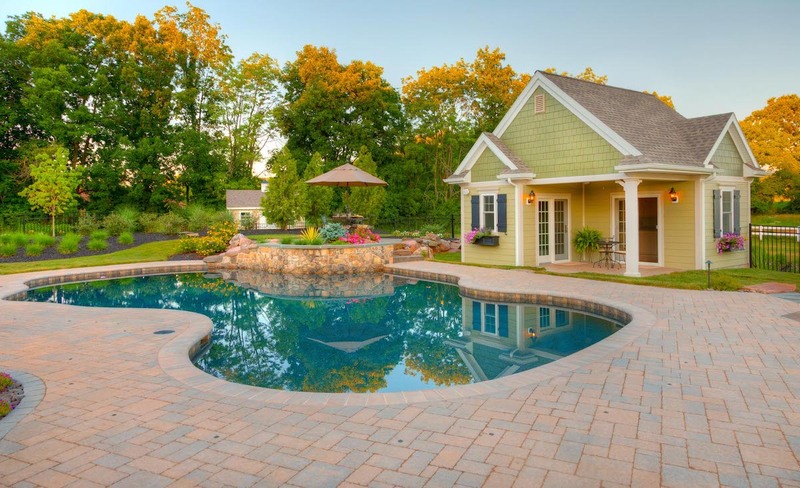 It’s quite common for homeowners to have ideas of their own as they begin a large-scale project such as a pool. 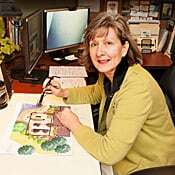 In this case, the homeowners had some very specific ideas from the “spec home” from which they were inspired to have their own custom home built. This family had fallen in love with a spec house they toured and had something similar built by the same builder. 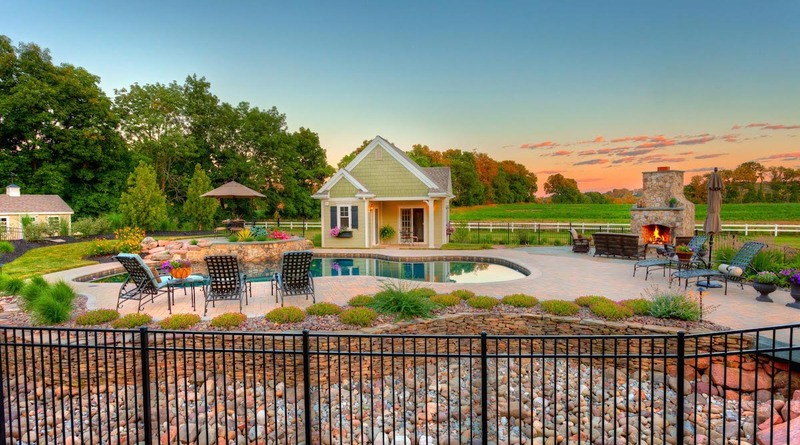 Only, unlike the tight and narrow development in which the spec home was located, this family had an expansive four-acre yard overlooking a nearby farm field. 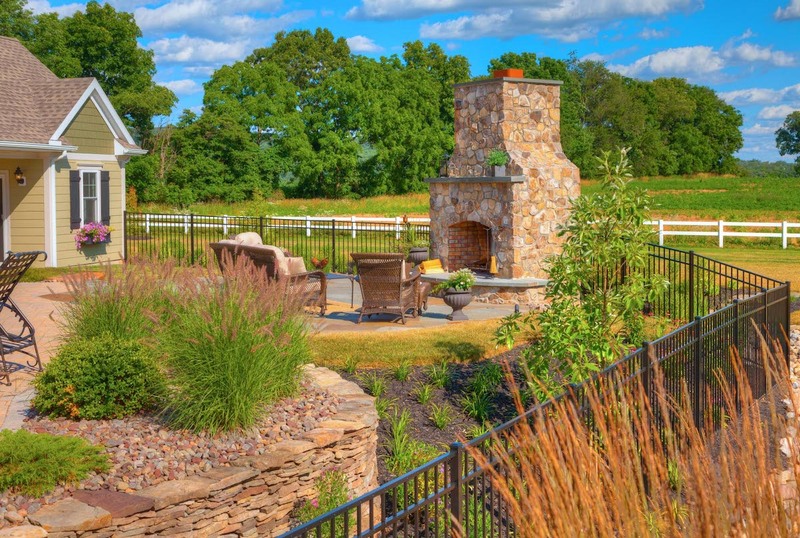 While they loved the backyard of the spec home, they needed some guidance in bringing their vision to life on a grander scale on their large property. 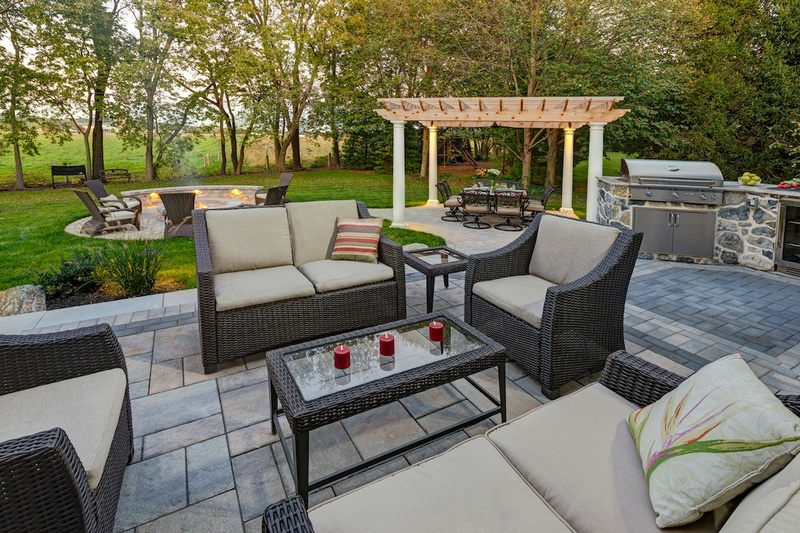 Initially wanting to mimic the backyard design of the spec home, the family thought a small patio and a pool close to the home would work for them. But the fact is, with how much space this backyard had, and how grand the home was, a tiny patio and pool simply didn’t fit the backyard properly. Because of that, we reworked the initial patio design to better fit the expansive space available. This also meant that the pool did not have to be situated so close to the house. While it was located right off the back door in the spec house design, on this particular property it would feel unnecessarily crowded being so close to the home. Pushing everything back in the design helped to take advantage of the spacious yard, really filling the space in a way that was aesthetically pleasing. Had the pool design kept it close to the home, there would have been a lot of unused space that would have looked out of place. Of course, as a 900-square-foot pool, it was undoubtedly on the larger side. This also made it important that there was ample room to walk around the pool so that it didn’t feel as though the pool itself took up the entire yard. The layout made all the difference in achieving this. 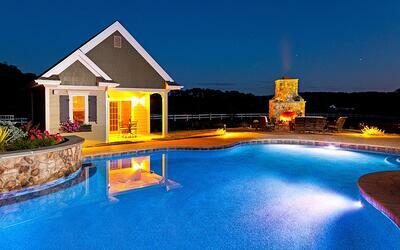 In the end, the pool was built in just the right place thanks to a well-thought-out pool design. 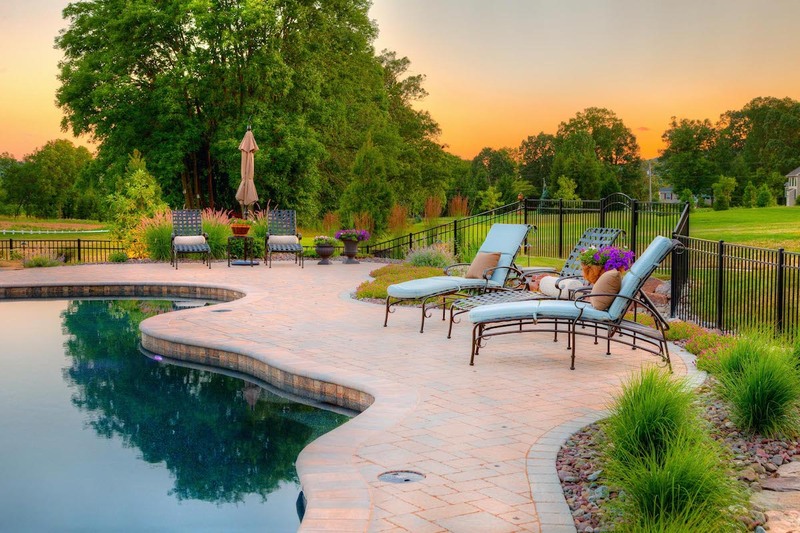 In addition to the pool itself, the family wanted a pool house which would feature an outdoor kitchen and storage area for towels and other pool supplies. While Earth, Turf, & Wood laid out this design, the family had their builder construct the house. 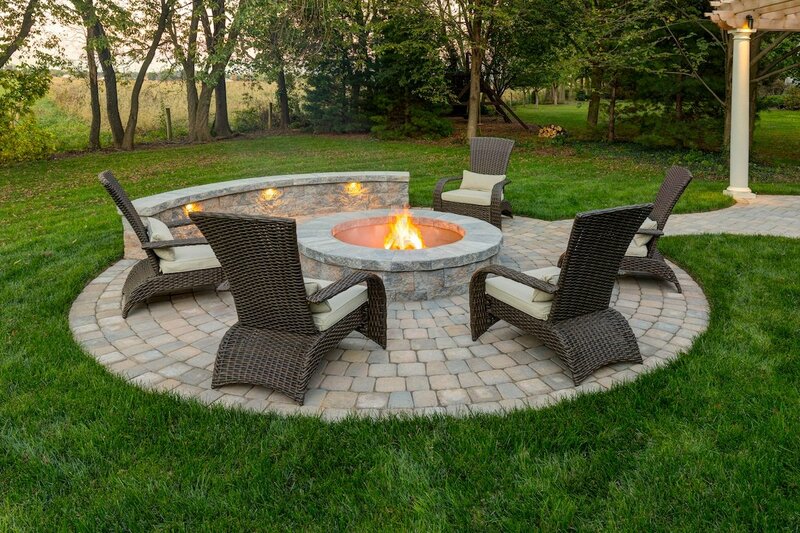 An outdoor fireplace and seating area were also added near the pool as a cozy spot where the family could hang out or their daughter could have friends over to visit. Natural steps lead down to the outdoor fireplace, which was purposely designed to be slightly lower than the area surrounding it so that it felt “nestled” in the corner, like a comfy little room. The homeowners had fallen in love with a particular fireplace style they had seen in a photo so we worked to recreate that look. The fireplace was built extra deep in the back in order to create some wood storage area behind it. Stepping stones leading down to that storage area provide easy access. 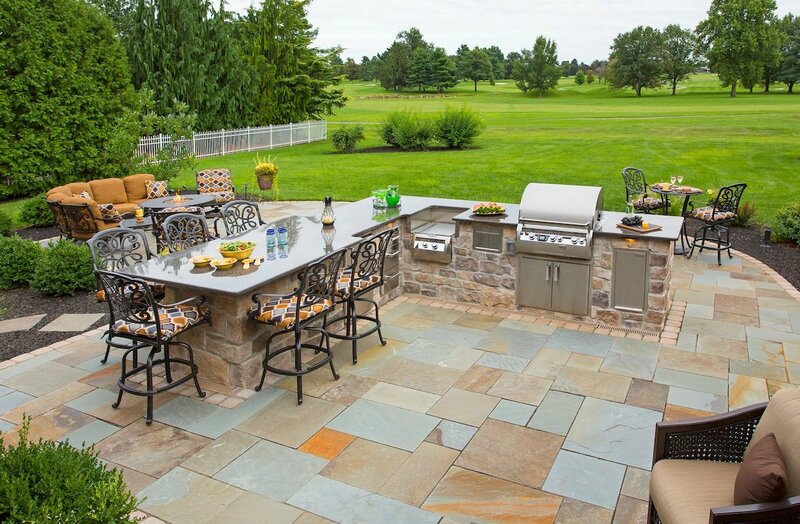 The beautiful natural stone from the fireplace is the same as the stone used in the pool design. No project is without its challenges and this one was no different. The biggest challenge faced on this project was the limited amount of hard surface that was permitted on the property. 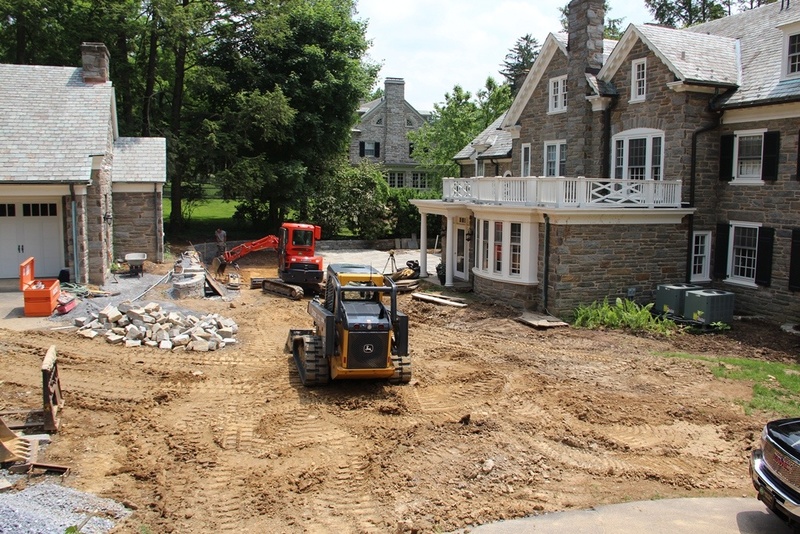 Despite being such a large property, adding the pool raised the number beyond the local requirement, making it necessary to implement stormwater management solutions. 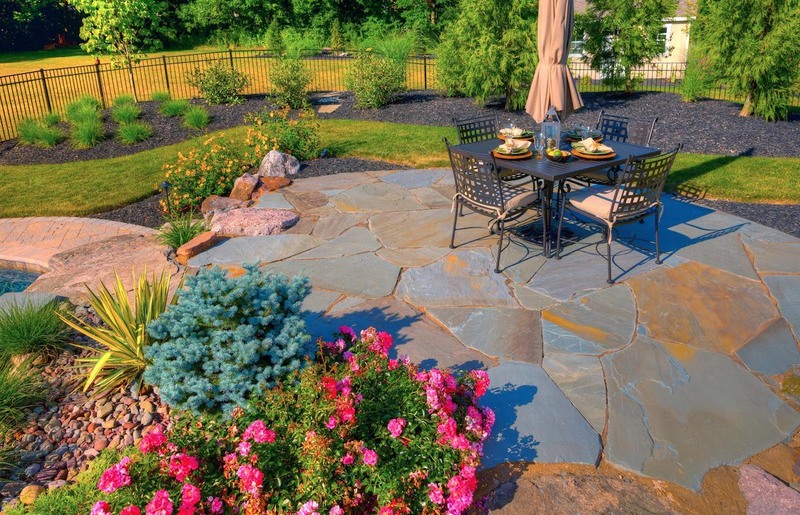 This was no small feat and not something that any old pool company in Lancaster, PA could do. In fact, there is a lot of specialized design involved in stormwater management and Earth, Turf, & Wood just so happens to have a background in it. The solution, in this case, was to create a dry river area that would help direct the flow of stormwater during periods of rain. This required some extra stone walls to be added to the property in order to help manage the flow properly. This solution helped to keep the property in compliance with regulations while still allowing them to have the pool of their dreams. This was a large project that required the design expertise as well as the in-depth experience of a true professional. Not only were there very specific challenges but this project also required delicately walking the line of incorporating client ideas with a design that worked best for the property. 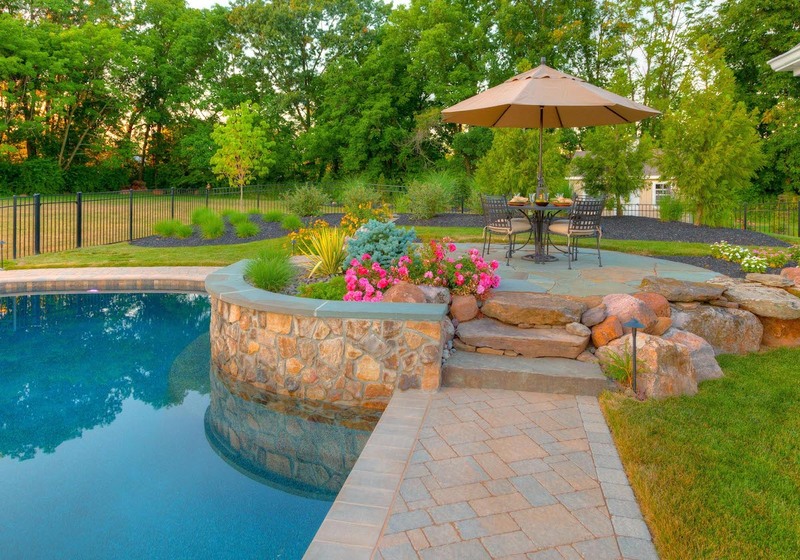 In order for everything to come together properly, it was critical that the family worked with the right pool company in Lancaster, PA.
Fortunately, finding the right company paid off and the family was able to ensure their ideas were incorporated into the final pool design in order to achieve their ultimate backyard. 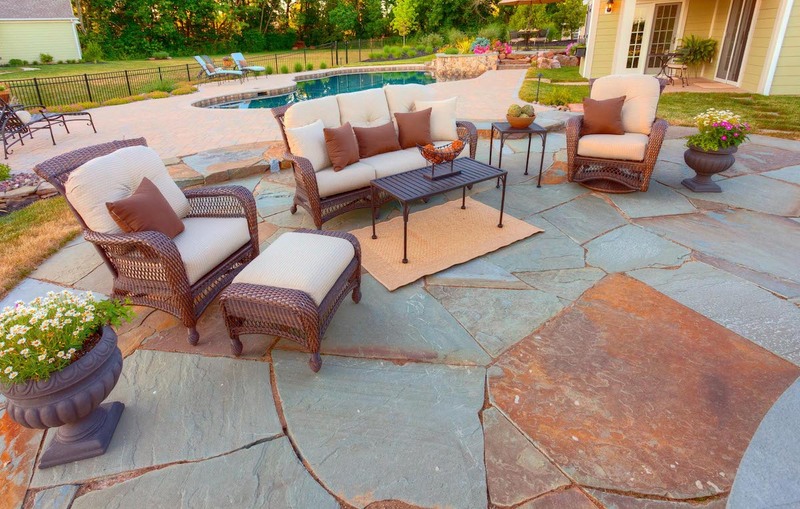 Having chosen a landscaping company that was able to address the challenges that arose in a way that wouldn’t compromise on their dream, the family was given exactly what they were looking for in their beautiful new space. 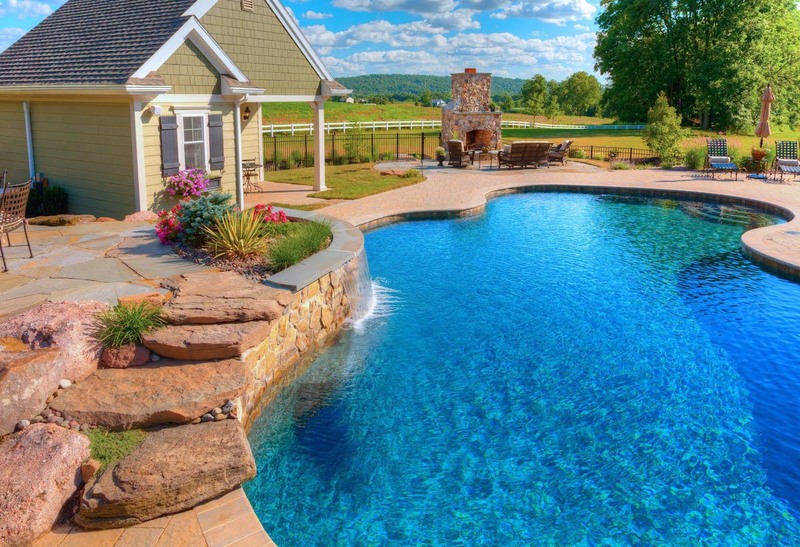 If you’d like to start a conversation about adding a dream pool (or backyard living space) to your Reading, Lancaster, Lebanon, or Hershey, PA home, contact us for a free consultation or give us a call at (717) 276-9447.